Last summer, I spent a long weekend in Los Angeles with my graphic designer sister, Victoria. We attended Dwell on Design, and toured a few modern homes. We also had the awesome opportunity to see the Eames House in Pacific Palisades and meet Eames Demetrios, the grandson of Ray & Charles, which was certainly the highlight of the trip for me. I am very much wishing I could attend this year, but the stars did not align, which is okay - I'll try to make it back in 2016 for sure. I was in the process of putting my business plan together for True Home Restorations, and figuring out what my next career steps would look like after (semi) retiring from my wedding planning & design business I opened in 2007. I knew I wanted to use breeze blocks in my branding somehow...thankfully, my sister was on board. A few months later, I spent another weekend with my sister, this time in her hometown of Chicago. We explored the southside midcentury community of Pill Hill. It was during that trip I came up with a silly saying, "I Brake for Breeze Blocks" that I thought would be dorkishly hilarious on a bumper sticker. You can read about our own breeze block project we hope to do at Mid Mod Mich this summer on this post from last fall. Anyway, I was so excited when Victoria sent me some ideas, and a couple of weeks later, a box of bumper stickers arrived at my doorstep. I posted the photo (upper right hand corner) on my personal instagram account and the next week started sending them to friends who requested them. It has been SO fun seeing them pop up on social media - who knew people would love them as much as I did? I haven't yet defaced my own car's bumper, but plan to in the near future - a huge step for me, as I'm not a bumper sticker fan in general. I suppose I will make an exception for my own! 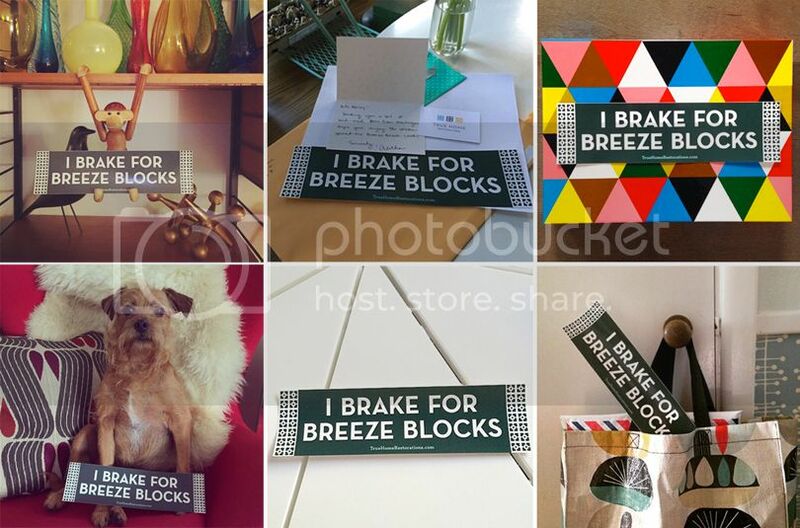 Keep braking for breeze blocks, my midcentury loving friends! And, if you'd like a sticker yourself, please let me know!